Stitching [G1575] - $8.00 : Yarn Tree, Your wholesale source for cross stitch supplies. 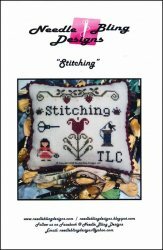 Cross stitch pattern by Needle Bling Designs. This would be a great design for someone who enjoys stitching! A flower is stitched in the middle of the design with a pair of scissors & a girl holding a needle & thread, stitched to the left of the flower. To the right of the flower, a spool of thread with a bird standing on the spool, is stitched to the right. "Stitching," is stitched at the top of the flower. Stitch count 67h x 81w.